I´m out germany and I don´t understand English very good. But Your page is very cool. Your picnicfood look very nice. That is a tasty, nutritious lunch. Your mum should be in charge of school meals in Bute and Argyll. Oscar's lunch box is cool! I want one. I am not fond of my food touching. I really hope that you get a great response to the guest blogs. It is so fun hearing how other's eat and view lunch time! The news about the 100,000 pound mark is wonderful! When I last checked in on Wednesday it was almost 90,000, so I am not surprised - just very pleased for the kindness of people. I will be happy to have oatmeal for my supper on the day you have the Oatmeal Party, though I will probably have it with butter and black pepper rather than anything sweet. Keep writing, it is so much fun to see what is happening on the NeverSeconds Food Front! I have already donated but happy to eat porridge for lunch for a week and donate my £3 a day that I spend on lunch if others will join in. Great idea! Am hoping to try some of the porridge served in Malawi for party. Looks very tasty and I love the edible flower - superb. Have you tried Nasturtium flowers? I think they are delicious with a salad! 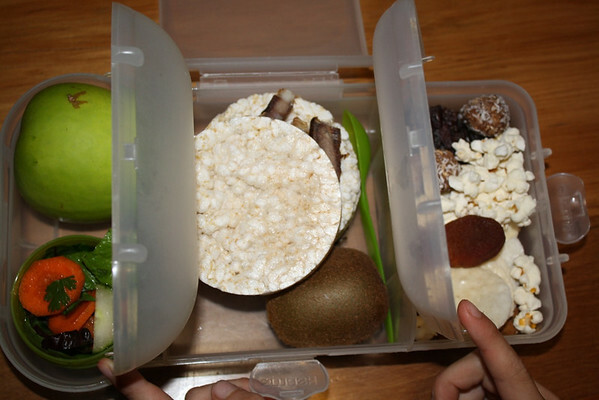 Both pack-ups look lovely! The variety in Oscar's is very impressive and I bet your grandpa's shortbread is better than anybody else's :o) I'm with Jerry on the nasturtium flower recommendation, they have a slightly peppery taste and look fabulous against green salad leaves. I hope you get a good harvest from your polytunnel plants! The rice cakes look like coffee mug coasters, and I'd tell Oscar not to bother with popcorn!! 2) I wonder why Veg only rated her lunch today an 8 out of 10 on the health scale. 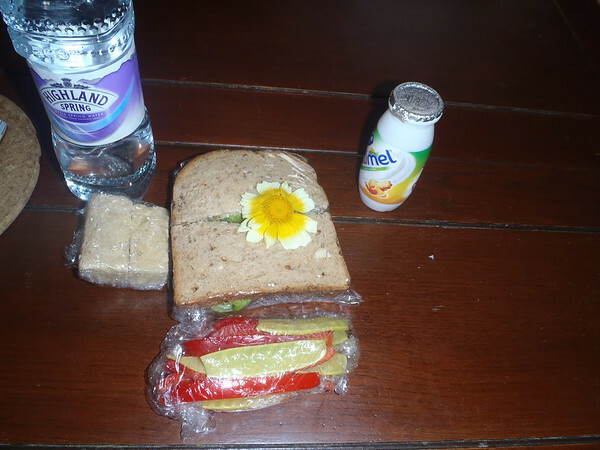 Lots of good protein (the cheese in the sandwich and the yoghurt drink), lots of good FRESH veggies (lettuce on the sandwich and the peppers and peas), and that looks like whole grain bread for the sandwich. And a lovely chrysanthemum blossom as well! True, the shortbread probably didn't add a lot of nutrition to the lunch, but -- given the rest of her lunch -- I'm not sure that really matters. I'd be curious to know what Veg thought her lunch lacked that would have given it the other 2 points. That looks like a really tasty lunch, Veg! And it is brilliant that so much of it is fresh and homemade. And where is you piece of fruit?? Oscar has two!! Homemade shortbread and your own home-grown peas and peppers: these are the best meals! I absolutely love that you put the flower on top, and ate it! We don't get many edible flowers here in Brasil. Anyway, congratulations on your 2dn place win! Your Mum and grandpa and you have joined forces to create the tastiest, most nutritious lunch I've seen here so far! I knew that any food you brought from home would be top-notch, this proves it. HI Veg!! Cheers from Brazil (south america) Love you and yor Blog !! Hi. Im webmaster from Poland. Ive read story about Your blog, and that teachers wanted You to abandon it. Im very happy that You made it working again. Im not really interested in school lunches, but as professional webmaster i see that You are doing really, really good work with this blog!! Please keep it doing and dont allow them to shut You down !! I hate censorships, i love freedom of speech. And remember - Your school cannot do You nothing if You write this blog in Your private time after school. Absolutely wonderful, young Veg. You are a star, although I read in the Telegraph that you might prefer not to be! Congratulations on meeting your 100k target - you have done more good in your nine years than most people manage in a lifetime. I was not aware you could eat a Chrysanthemum. It looks lovely! She might try to sneak a pic of her school food (she's often complaining about it) but she's not really allowed to take pictures at all at her school. Hi VEG. I am delighted to see that your blog is still publishing - and with your wonderful pictures. (And I hope that your school's administrators have learned an important lesson: Don't mess with a student on a mission of health! Congratulations.) When compared with she chool lunches that I ate as a child, oh so many years ago, yours have about the same appeal, but are much more healthy. (At least in America, there was an interim where the lunches were neither.) I also think that your lunches look better and are a bit more balanced than some of the meals posted by your foreign friends. It is wonderful that you are paying such close attention to your nutrition and that you have such wonderful support from your Dad (and Mum too, I'd guess). You have already changed the Food Police rules at your school and many other schools are taking notice of your work. But... let us not forget that providing excellent quality meals is not free. At some point, Mum and Dad, or their taxes still have to pay for these meals. I've sorry to hear about your arm injury and the (cannot remember your term for it, but..) the cast. It will be gone before you know it. And lastly young lady, CONGRATULATIONS for raising over 108,000 pounds for the Mary's Meals project. If I can find the proper button, I'll send my own modest contribution. Hundreds of thousands of readers are VERY proud of you. The bread on your sandwhich looks so yum! Japan doesn't do good bread in general. It is all fluffy white and comes in loaves of 5 or 6. I crave whole grain bread and am thinking of investing in a bread maker - or perhaps just learning how to bake bread myself. Congratulations on your relay results. Thats great!! Is there any chance of getting the shortbread recipe from your grandpa? I would love to bake it with my daughter Greta. She is only 3 y.o. but loves to cook and bake with me. We are trying to eat as healthy as possible. Picnics give students a temporary relief from their studies. After enjoying a picnic, they feel fresh and take up their studies with renewed vigor. Every school and college arranges picnics for its students.